As planned, I used today's run to complete my hill training for Sunday's race. Until the new treadmill is repaired tomorrow (I'm really hoping a replacement motor will remedy the belt slips) I'm being careful not to run at faster speeds on the machine. I set a pace just below 6 MPH and pushed the incline steadily up to 5%, starting first with 2% and adding a percentage point every couple of minutes until I reached 5. Even at a slower pace, running a 5% grade was hard work. Near the end I brought the incline down to 0 and ran the last couple of minutes around 6.8 MPH. 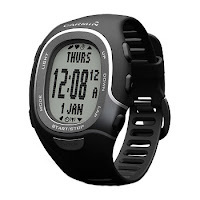 I received my Garmin FR60 yesterday and put it to work today. It was great to see it sync up with my FR 50's foot pod and while the interface on the FR60 is still fairly opaque it's an improvement over its predecessor. Once I understood the menus and navigation I realized that FR60 has some very nice features that the 50 lacked, such as automatic capture of split times. I'll need to calibrate the FR60 because its distance numbers weren't aligned with the treadmill's but I've also been suspicious of the treadmill's accuracy and that could be related to the motor problem. The FR60 has something called "Race Mode" that sounds interesting. I plan to look online at the expanded manual to understand what that means and how it differs from normal training mode. Tomorrow I plan to go out for a regular run to finish my training for the race. I feel good and I did very well with the inclines. Although my pace was modest the effort was not. Based upon the summary metrics, adjusting for the incline (per my chart) I averaged an equivalent of 9:00 per mile on a flat course. I'm happy with that since I usually reduce my normal pace by 20-30 seconds per mile on race day.